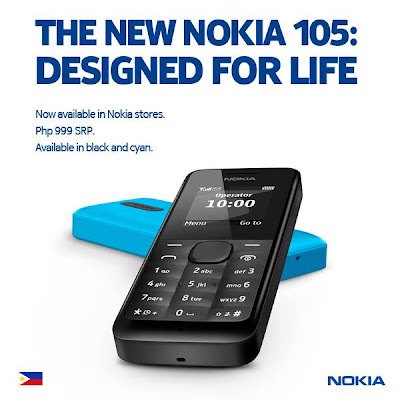 Home Gadgets News Nokia 105 now available in the Philippines for only P999, standby time of up to 35 days! Nokia 105 now available in the Philippines for only P999, standby time of up to 35 days! Nokia Philippines just posted on their Facebook page that the Nokia 105, its most affordable phone to date is now available for purchase in the Philippines. The Nokia 105 is the ideal device for the first-time phone buyer, featuring a bright color screen with clear menus and essentials like FM radio, multiple alarm clocks, speaking clock, a dust and splash-proof, pillowed key pad, and a flashlight. Its durability and up to 35-day battery life also make it ideal for people seeking a back-up device. It has the everyday essential features you could want in a basic phone, combining both productivity and leisure tools. The Nokia 105 carries an FM radio*, up to five pre-loaded games, multiple alarm clock capabilities, a speaking clock and flashlight. In addition to its user-friendly interface, it has a battery standby time of up to 35 days and talk time of up to 12.5 hours. The Nokia 105 retails for only Php999 (SRP) and is available at Nokia stores nationwide. The handset is available in cyan or black. BWAHAHAHA! Nokia probably thinks we Pinoys are going to be smitten with this. Hell, they probably think were dumb. Leave us alone - local brands are much much much better spec'd and priced that this piece of detergent bar!!!! !